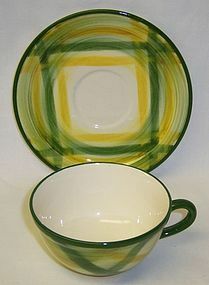 This is a really pretty Gingham Cup and Saucer made by Metlox Vernon Ware of California. Both the Cup and Saucer are in very good condition with no chips, cracks or scratches. The plaid decoration is all very good. The Saucer is signed Under Glaze Hand Painted GINGHAM Vernonware California U.S.A. Be sure to search our other Vernon Ware available. We guarantee all items to be as described. Feel free to email any questions. THANK YOU. 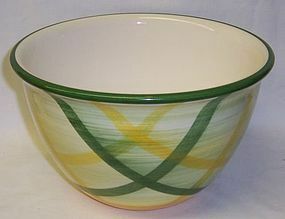 This is a really pretty Gingham 9 Inch diameter large Mixing Bowl made by Vernon Ware of California. This Mixing Bowl measures 5 1/2 inches high and is in very good condition with no chips, cracks or scratches. The plaid decoration is all very good. 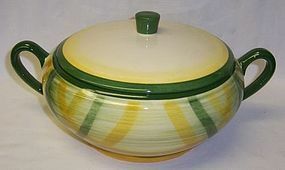 It is signed AUTHENTIC Vernonware MADE IN U.S.A. Be sure to search our other Vernon Ware available. We guarantee all items to be as described. Feel free to email any questions. THANK YOU.